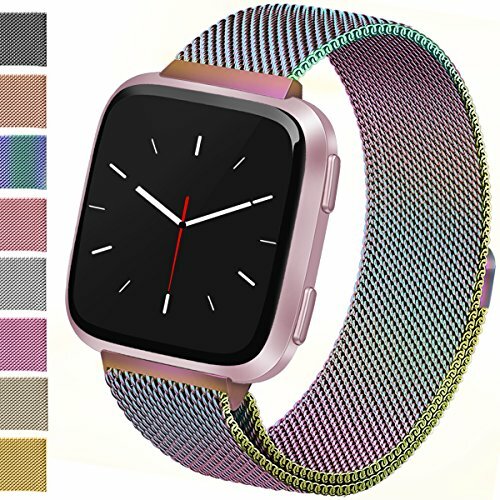 Material: Vancle Fitbit Versa bands made of Durable Stainless Steel Woven Mesh. This smooth stainless steel Mesh of fit bit versa bands wraps fluidly around your wrist, which is soft breathable and comfortable to wear. Color Available: More color choices than original Fitbit versa bands. Vancle fitbit versa bands in Champagne, Rose Gold, Rose Pink, Gold, Silver, Black, Rainbow, Sakura Pink etc colors are available for Fitbit Versa Smartwatch. It makes the Fitbit Versa look fashion, more like a beautiful bracelet and less like a smartwatch. Size Available: Fitbit versa metal bands Small Size for 5.5 -- 9 inches wrist, replacement versa bands Large Size for 6.7 -- 10 inches wrist. Adjustable strong magnet clasp is convenient to adjust the length of your fitbit versa band, provides strong stability and safety for your Versa Smartwatch. No buckle need, No adjustments like typical wristbands. Comfortable to Wear: Vancle fitbit versa bands with precise cutting process make the connectors fit perfect for your Fitbit Versa and the edge of the fitbit versa bands are smooth, which will not hook clothes and bring you a comfortable breathable wearing experience. Easy to get on and off: Vancle Versa bands are easy to get on off, The stainless steel lugs which connects to Fit bit Versa precisely and securely. Very easy to remove your old fitbit versa band and easy to replace your new versa watchband. 1 x Metal Replacement Wrist Band for Fitbit Versa Watch. NOTE: Fitbit Versa Smartwatch is not included! One Year Warranty --Replacement or full refund without return the fitbit versa watch band. Vancle Fitbit Versa Bands Metal wristbands fit for Fitbit Versa Smart Watch. Perfect fitbit versa bands replacement to interchange your original fit bit versa bands. Package included: 1 x Replacement Fitbit Versa Band, 3 x quick release pins -- one more pin as backup. Note: Fitbit Versa Smartwatch is NOT included. Available in fitbit versa bands Champagne, Rose Gold, Rose Pink, Gold, Silver, Black, Rainbow, Sakura Pink etc. Vancle fit bit versa bands metal look fashion and dress up your fitbit versa. Both men and women when sport, dating, meeting etc. You will get tons of compliments on how nice it looks. Small & Large sizes for option. Vancle fitbit versa bands Small fit 5.5" - 9" wrist, Replacement Fitbit Versa Bands Large fit 6.7" - 10" wrist. Adjustable strong magnet clasp is convenient to adjust the length of your fit bit versa bands, provides strong stability and safety for your Fitbit Versa. Vancle Fitbit Versa bands replacement with quick release pins fit seamlessly into your Fit bit Versa Watch interface precisely and securely as original fitbit versa bands. No worry about falling off your precious fitbit versa. ONE YEAR Warranty: Free fitbit versa bands replacement for your fitbit versa or full refund without return for any quality problem. If there is any question, please feel free to contact us via Email, Vancle will provide every customer excellent purchasing experience.